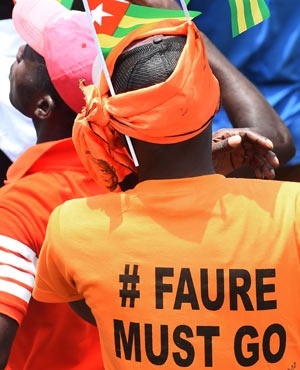 Togolese are growing tired of the 50-year-rule of Gnassingbe family and have decided to demand a CHANGE! "We have been asking for political reforms since Faure Gnassingbe came to power in 2005 but he managed to dodge us since then," said Tikpi Atchadam, who leads the National Panafrican Party. "Now we are simply demanding a return to the 1992 constitution." Wednesday's protests took place in the capital, Lome, and in other cities as well as in Ghana and Gabon. Security forces killed at least two people and injured several others during similar demonstrations in August, Amnesty International said. Dozens were sent to prison for up to 60 months, according to the human rights group. The government condemned the August protests, with the interior minister calling them extremist. A coalition of opposition parties called for the demonstrations. While Gnassingbe has not said he would run again in 2020, the opposition National Panafrican Party has said it suspects he will not quit power unless compelled to step down. Gnassingbe's father, Eyadema, ruled for 38 years until his death in 2005. Before his death, he modified the constitution to extend his rule. The constitution had allowed for only two presidential terms.